India's battle epic film Baahubali (Strong Man), billed as its most expensive film to date, has released in cinemas on Friday. 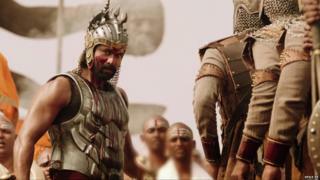 The two-part film, directed by SS Rajamouli, was made at a reported cost of about $39m (£25m). No date has been announced for the release of the second part. The film, which has been compared to Zack Snyder's fantasy war film 300, has generated great interest because of its "massive budget" and special effects. Baahubali focuses on a prince who is smuggled out of his kingdom and eventually returns to reclaim it, fighting an epic battle along with his brother to save it from a murderous army. Estimated budget: £22.7m ($35m) as reported by Hindustan Times. Plot: Tamil superstar Rajnikanth plays a scientist who creates a "super robot" modelled on himself. The robot looks human, but has superhuman qualities. The "super intelligent" robot remembers world history, knows medical science, warfare and everything in between. Things go horribly wrong when a villain ends up corrupting the robot, causing it to turn against its creator. But many epic scenes later, it shows loyalty to its master and ends up destroying itself. Estimated budget: £15.5m ($24m) as reported by IMDB website. Plot: 'RA.One', played by Arjun Rampal, is a originally a video game villain who is stronger than the hero, but havoc ensues when he comes out of the virtual world and into reality. He kills the creator of the game Shekhar, (played by Shah Rukh Khan). Can the game's hero G.One, also played by Shah Rukh Khan, save the day? Turns out, he can. Estimated budget: £13m ($20m) as reported by the NDTV website news channel. Plot: Rajnikanth plays the role of Rana, a warrior, who returns to his homeland to take revenge for the death of his father. The film was compared by some critics to James Cameron's Avatar. Plot: Aamir Khan plays a bank robber who also owns a circus. Abhishek Bachchan, who plays a good cop, investigates the robberies and tries to arrest Khan's character. A love triangle, high tech and a double suicide complete the plot of this film which was the 77th highest grossing film of 2013 worldwide.